The Bridge Room in Sydney is located within the heart of the Sydney Central Business District (CBD) and is within walking distance of key landmarks such as the Opera House and Circular Quay. Owned by Chef Ross Lusted and his partner and Sunny, The Bridge Room is recognised as one of the best restaurants in Sydney, receiving many glowing reviews and high critical acclaim. The Bridge Room holds a Two-Hat distinction (out of a possible three) as awarded by the prestigious Sydney Morning Good Food Guide. In 2014 Chef Lusted himself was also recognised as The Chef of The Year by the Sydney Morning Herald Good Food Guide and as the Hottest Chef in Australia by the Weekend Australian Magazine Hot 50 Restaurants. Chef Ross Lusted has had an illustrious cooking career, previously holding the positions of Executive Chef at Sydney’s Rockpool, Park Hyatt Sydney’s Harbour Kitchen & Bar and Singapore’s Mezza9. Chef Lusted then went on to become the Head of Food & Beverage Development for Aman Resorts before returning to Australia and opening The Bridge Room in 2011. The Bridge Room serves Modern Australian cuisine, drawing inspiration from European and Asian influences cooked with the best of local, seasonal Australian produce. Housed in an art deco building, The Bridge Room features an open kitchen with a custom built charcoal grill. The dining room is rectangular in shape and is modern and airy in its design, with a key feature being the hand-made ceramics designed by Chef Lusted himself. 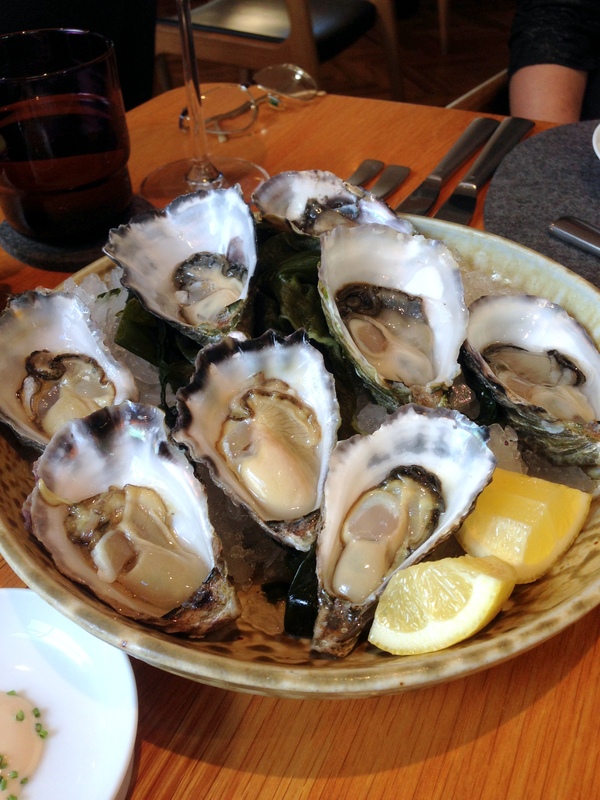 We had an amazing experience at The Bridge Room, starting with some Smoky Bay Pacific (on the right) and Port Stephens Rock oysters ($4.50 each – £2.10), both of which were gorgeous. Meaty and tasty with a rich sea flavour, the oysters were served with a shallot and red wine vinegar as well as a white miso dressing with chives that was fabulous.